Lemon poppy seed bundt cake (as shortcake) with macerated strawberries and basil ice cream at Pawpaw in Charleston, S.C.
A sure sign that summer is imminent is the proliferation of strawberry shortcake on menus. This year, chefs are celebrating the arrival of berry season with familiar and innovative versions of this classic dessert. Alberin’s “something more” is called Love Me, Love Me Not, an intricate take on classic strawberry shortcake. The dessert, which is evocative of a flower, is made with wild strawberry mousse with a mixed berry gel inside, on top of a shortcake base. It’s finished with a white chocolate and cocoa butter spray to give the exterior a velvety look. Also looking to make a strawberry standout is DaVee Harned, pastry chef at Pawpaw in Charleston, S.C. Harned’s creation features a lemon poppy seed bundt cake for the shortcake and first-of-the-season strawberries macerated with brown sugar, served with a side of basil ice cream. “It's just super light and fresh,” Harned said. “It also just puts a different twist on something that is very traditional. I wanted to have something that you can't get everywhere else." 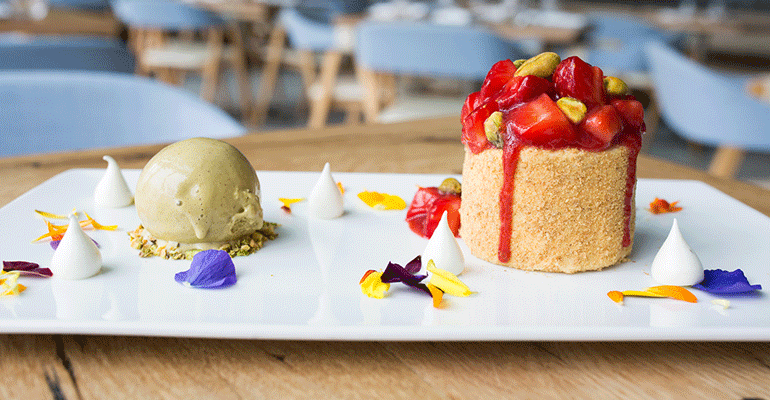 Layers of strawberry shortcake topped with strawberries and pistachios at Halifax in Hoboken, N.J.
At Halifax in Hoboken, N.J., pastry chef Stuart Marx adds height and an unexpected crunch to the summer favorite. His strawberry shortcake is made with three layers of vanilla spongecake, each brushed with a strawberry sauce that also contains lemon and sugar, then coated with graham cracker crumbs and topped with fresh and pureed strawberries and pistachios. It’s served with vanilla whipped cream and a scoop of roasted pistachio ice cream. 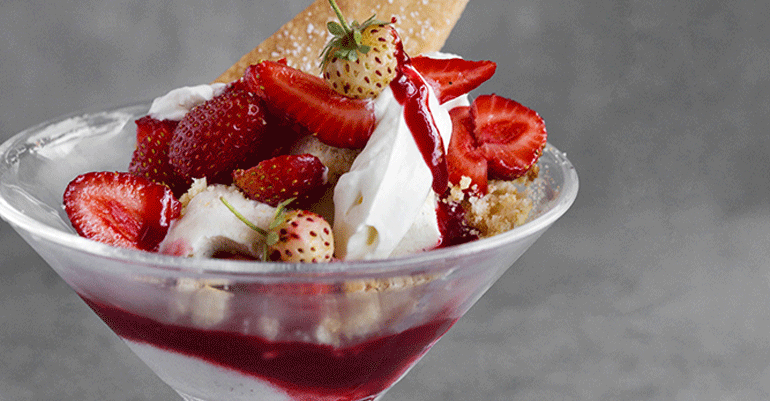 And at the Tuck Room Tavern in Westwood, Calif., chef Sherry Yard serves a deconstructed strawberry shortcake: She places Harry’s Gaviota strawberries, Scottish shortbread and Bellwether Farms whipped cream in a decorative glass. Chains are serving up strawberry shortcake, too. From June 19 to the end of August, Buffalo Wings & Rings, the 55-unit, family-friendly sports bar chain, will serve a cookie shortcake base dusted in powdered sugar and topped with vanilla ice cream, strawberries that will be locally sourced by each franchisee, and whipped cream. Deconstructed shortcake in a glass at The Tuck Room in Westwood, Calif.
Shortcake is resonating so strongly that some pastry chefs, like Amy Beeman of The Rieger in Kansas City, are finding creative ways to menu it even before strawberries comes into season near them. Despite fresh strawberries not yet being available near Kansas City, Beeman is whipping up a spin on the nostalgic dessert that has a similar taste and texture but takes advantage of another in-season favorite: rhubarb. Beeman’s rhubarb shortcake is made with buckwheat shortcakes that are split open and filled with rhubarb puree. That’s topped with orange blossom pastry cream and finished with fleur spice (a mixture of pink peppercorn, hibiscus, rose petals and mint), and served with a side of poached rhubarb. The combination of the ingredients makes “everything pink and springy,” Beeman said.